A six month residency at a senior center in New York’s Chinatown culminates in this exhibition presenting colourful performance outfits, photography and video. ‘Wearable Art Class’ gathered every Wednesday at the City Hall Senior Center since January and got wilder by the week. More information about the many contributors and organisations involved in the project below. For Wearable Art Class, members of the Hamilton Madison House City Hall Senior Center will be showing off the products of their labors with a display of handmade costumes, photography, and video that prove that beauty, age, and creativity can be synonymous. The show will feature bright colors, uncommon materials, and innovative fashions so appealing that visitors will want to take them off the shelf to wear to the next party. 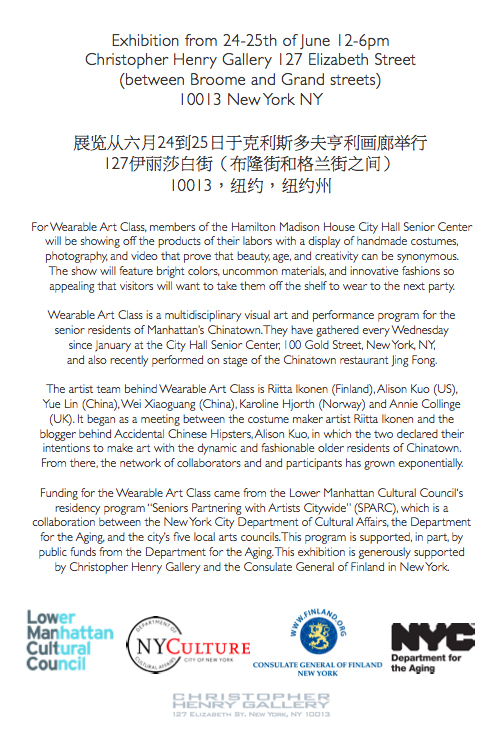 Wearable Art Class is a multidisciplinary visual art and performance program for the senior residents of Manhattan’s Chinatown. They have gathered every Wednesday since January at the City Hall Senior Center, 100 Gold Street, New York, NY, and also recently performed on stage of the Chinatown restaurant Jing Fong. 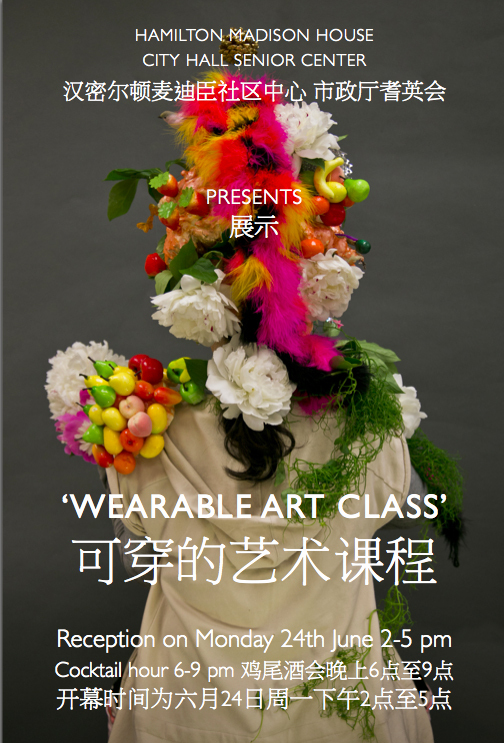 The artist team behind Wearable Art Class is Riitta Ikonen (Finland), Alison Kuo (US), Yue Lin (China), Wei Xiaoguang (China), Karoline Hjorth (Norway) and Annie Collinge (UK). It began as a meeting between the costume maker and performer Riitta Ikonen and the blogger behind Accidental Chinese Hipsters, Alison Kuo, in which the two declared their intentions to make art with the dynamic and fashionable older residents of Chinatown. From there, the network of collaborators and and participants has grown exponentially. Artist websites: www.riittaikonen.com/, www.kuospace.com, www.linjiayue.com, wxiaoguang.4ormat.com/, karolinehjorth.wordpress.com/, and http://www.collinge.com/. Funding for the Wearable Art Class came from the Lower Manhattan Cultural Council‘s residency program “Seniors Partnering with Artists Citywide” (SPARC), which is a collaboration between the New York City Department of Cultural Affairs, the Department for the Aging, and the city’s five local arts councils. This program is supported, in part, by public funds from the Department for the Aging. This exhibition is generously supported by Christopher Henry Gallery, the Consulate General of Finland in New York, Nordic Breads, Recess and Materials for the Arts.